Even More Making is Soon to Come to Our City. A Makerspace is particularly appropriate for Garland because we are a community of makers with a history that goes back to the earliest days of our City when we made our own utility company. The early residents of Garland tried to hook up with some of the existing utility companies from larger nearby cities such as Dallas, but those entities did not want anything to do with Garland because it was too small at the time. Consequently a few enterprising locals formed a cooperative and purchased a generator. This group eventually grew into the Garland Power and Light Company. People have been making things since the dawn of time when our earliest ancestors made tools and utensils from stone and clothing from the hides of animals. Makerspaces are unique. They mix the use of old technology with the latest technology for making things and Makerspaces are places that bring the elements of community and sharing into the picture. Instead of one creator working alone in closet or garage at home, makerspaces are alive with the synergy and sharing of many creators working under the same roof, sharing tools and ideas. In my opinion, what really pushed makerspaces to the forefront during the 21st century was Make: magazine in 2005. As with any idea, new thing or technology, explanations are needed in order for people to understand its use and potential and Make: magazine has filled this needed niche. Makerspaces provide new and old technology and tools for the makers. Especially with the new technology and tools, individuals might not be able to afford to purchase them, but they can join a Makerspace and after training, have access to them. 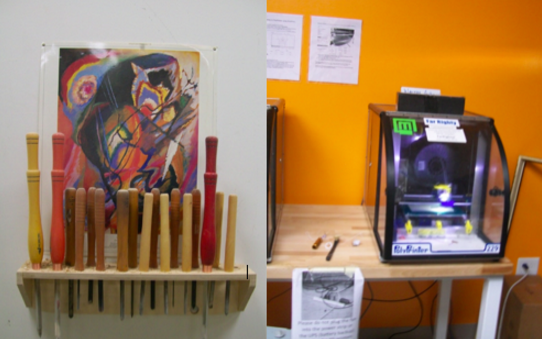 Some say that today’s Makerspaces had their roots in the Fab labs at MIT. Perhaps. Others suggest they arose from the Hacker community. One of the most exciting new technological tools usually available at Makerspaces today is the 3D printer. For those of you who have heard about them, but who aren’t exactly sure how they work, the following information may shed some light on the topic for you. Nearly all Makerspaces have at least one 3D printer. 3D printers are a new generation of machines that can make ordinary objects. They can produce different kinds of objects, in different materials, all from the same machine—from metal machine parts to plastic toys. They are even being used to manufacture prosthetic devices for human beings. A 3D printer can be viewed as a somewhat self-contained micro-factory. Among other things they include a tank for pouring the material in that will make the object and a build platform for making it. The 3D printer reduces the amount of space required for old technology that did the same thing. For example, using old technology, it takes a factory to turn out a spatula that you use in your kitchen. Using a 3D printer, all you need is a computer, software, and a 3D printer. If you look at a page of text from your home printer under a microscope, you’ll see the letters are sitting slightly on top of the paper. Theoretically, if you printed over that same page a few thousand times, eventually the ink would build up enough layers on top of each other to create a solid 3D model of each letter. 3D printers work by creating many stacked tiny layers that eventually create a physical form. After you have sent the “slices” of your model to the 3D printer, it can take several hours up to several days, depending upon the printer and the size of the object being created. What kinds of materials can be used to create objects with 3D printers? Ordinary ink jet printers use ink. 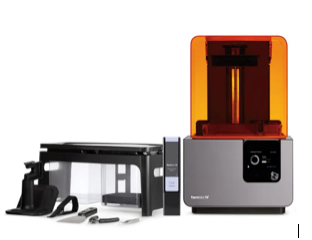 However the type of 3D printer that you are using dictates the kinds of materials you can use in the 3D printer. Generally speaking, just about any material that can be squirted out in liquid form can be used. Here is a list of current possibilities: sintered powdered metal; carbon fiber and other composites; carbon nanotubes and grapheme embedded in plastics; Nitinol; water-absorbing plastic; stem cells; conductive carbomorph; paper; edible substances; and even concrete. How exactly do you make something with a 3D printer? The big picture: You design a 3D object on an ordinary home computer with 3D modeling software (or a 3D scanner), slice the design into hundreds of horizontal slices, connect the virtual display of the sliced object to a 3D printer, and press ‘print’. Soon Smart phones will come with 3D scanners. Microsoft (Kinect) and Google enabled their hardware to perform 3D scanning. 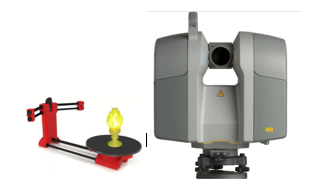 Today the price range for 3D Scanners varies from $100 to $66,000 and more. You can pay thousands of dollars for this software, or you can use open source such as Blender, for instance. Tinkercad has a free version and it works in browsers such as Chrome. 2. Prepare your 3D model for printing by slicing the virtual image. This step slices the image of the object you created into hundreds (sometimes thousands) of horizontal slices. This step is performed within the 3D modeling software, or, depending upon the type of 3D printer you have, you may have to use a slicing tool for that particular 3D printer. 3. Make sure you have the materials for making in the 3D printer. 4. Feed the sliced virtual model to the 3D Printer. When will Garland have a Makerspace? We are too soon in the process of creating one to provide an exact date, but I am confident that Garland will have a great makerspace before we see the end of 2018. I will keep you posted. Change and new ideas often take time to gain acceptance. Remember, there is always the bell-shaped change curve to take into consideration when introducing any concept that smacks of change. In responding to change: Two percent are innovators; ten percent catch on fast and are early adopters; sixty percent are middle adopters who are reasonable in their analysis of a new idea, but inclined to maintain the status quo at first; Twenty-percent fall into the category of "late adopters" who are inclined to accept change after the change is already in the mainstream; Eight percent are laggards whose commitment is always to the status quo and the past. If they had their way, which thankfully they do not, time and progress would be frozen.